We appreciate and value all the support we receive from around the world – no matter how big or small the contribution. Without this support, we would not have come this far! Thank you. We would like to acknowledge and thank our most valuable change makers who provided substantial financial support and trust at the beginning stages. This unparalleled support gave Hanne and Ted the initial courage and strength to shape their intent into a much broader vision. They continue to be supportive to this day. Humanitas Afrika is an African-Czech NGO based in Prague who support projects that help disadvantaged children. We would like to acknowledge and thank our individual, corporate and private foundation donors and supporters for their generous ongoing financial support. Our donors and sponsors make it possible to provide the education, care and tools the children need on a day-to-day basis to empower them toward a brighter future. We believe that all contributions – no matter how big or small – are valuable and make a huge difference in the lives of the HHFL children! The Peacock Family Foundation is a private Montreal-based foundation that supports vulnerable groups. Since 2013, the Peacock Family Foundation has been providing an academic scholarship to support two HHFL University students in Kenya. The First Group is a Dubai-based property development company. Since 2011, The First Group has been providing an academic scholarship to support four HHFL University students in Kenya. 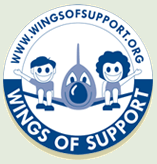 Wings of Support is a private initiative of the employees of KLM and Martinair. The initiative helps children in countries where the airlines fly to provide shelter and education. Wings of Support provided the water system at HHFL. We are fortunate to have caring champions around the world. We recognize and celebrate the incredible efforts of our longest standing champions who continue to blend creativity, enthusiasm and commitment to help us secure funds for the HHFL children and youth in their own communities. Jennifer and her company, Pinnacle PR, have been strong supporters since 2007. Most recently, Jennifer spearheaded the 2013 Mount Kilimanjaro Challenge in partnership with Dubai-based Gulf for Good raising $40,000 for post-secondary education. The Kenya Cup is an annual softball tournament in Toronto between advertising agencies that is organized by Steve Groh and his committee. Over the past eight years, the Kenya Cup has raised over $100,000 for the high school education fund. Since 2008, Joy and Marium have been organizing a yearly garage sale in New Edinburgh, Ottawa Canada, which raises tuition fees for the HHFL high school girls. Lynda and her daughter, Lilley, in Switzerland have been raising money through Lilley’s scouts group and school since 2009. They often visit HHFL to volunteer. The funds they raise go toward the primary school education. We are fortunate to have training partners in Kenya who support the development of the HHFL children and youth’s skills and knowledge base. IBM Kenya provides valuable IT and computer-related training and mentorship to HHFL’s primary school, high school and post-secondary students. Akirachix is a Kenyan-based training and mentorship company that aims to empower women in technology. They hold many technology boot camps and training programs to expose young women to the field of technology and encourage IT careers. HHFL girls are invited to participate in select training programs throughout the year. Our ambassadors are individuals and companies around the world who create awareness of the HHF cause to help reach and inspire bigger audiences. We acknowledge and thank their contributions. Moyra is a committed Kenyan volunteer who educates the HHFL children to the wonders of wildlife and nature. She brings qualified teachers to HHFL and leads activities that help expand the children’s horizons. Director Riyad Barmania and producers Diego Pascoalino and Christian Marion Lohr came to HHFL in 2010 to film a documentary about our work and the HHFL children entitled “Story from the slum: An Unexpected Family”. The documentary has since won awards and is being submitted to film festivals around the world.